3.) 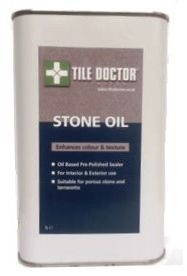 Ensure surface to be treated is completely dry and free from Contaminants which may prevent Stone Oil from properly curing. 4.) Apply by Brush, Paint pad or lint free cloth depending on the required application, please note more porous stone may require more than one application, remove any excess Oil that has not been fully absorbed with in an hour with Lint free cloths. 5.) Leave to cure for a minimum of 24 hours before finishing the surface with a suitable sealer. 6.) Used cloths should be burnt after use, as they may spontaneously combust. 1 litre tin £14.99 each. ♦ Not suitable for floors without a damp proof membrane, ie Victorian floor Tiles. ♦ Rapid oxidisation may inhibit effectiveness of the product. ♦ Allow good ventilation during application. ♦ Avoid direct sunlight if working outside as this will effect curing times. ♦ Stone oil may cure more rapidly in dry or higher temperature conditions. ♦ Do not empty into drains and avoid release to the environment. IF INGESTED: Seek immediate medical attention. SKIN CONTACT: Contact can cause an itchy rash and mild irritation, wash thoroughly after handling, if symptoms persists seek medical attention. EYE CONTACT: May cause irritation and redness, flush immediately with water if symptoms persists seek medical attention. INHALATION: May cause congestion of the lungs causing severe shortness of breath, if symptoms persists seek medical attention.